← The sweet smell of Fear and Arepas. The slippery black mud gives way yet again under my feet and I slide backwards, landing ungracefully on my knees, my left hand clinging to alpine shrub, my right hand half submerged in a freezing cold puddle. Alone here at 3,600 meters in the middle of a National Park somewhere in the Colombian Andes I really feel the immensity of the hostile environment and really, REALLY start to question my own sanity. It is amazing to me that just 2 hours ago we were at the base of the park, sweating in the bright sun, contemplating if we could even do the hike. When I first read about the hike in our ever-present Lonely Planet guide book I read that it took 6 hours. Somehow I concluded that that meant it took 6 hours including the 45 minute travel time each way to the park, the 3 km hike up to the station, the 10km return trip to the lake where the Muica indigenous people claim is the birthplace of humanity , and the 3km walk,45 minute bus ride back. I think I understand now that exactly this sort of reasoning is why I am generally late to absolutely everything. That left us a little under 4 hours to complete the 10km hike and run the 3km back to the bus. The park closed at 6pm and the park ranger was unwilling to let us start the hike, afraid we would get stranded or break our legs struggling to get back in the dark. Turning around to accept my defeat I heard to my dismay my boyfriend persuading the park ranger to let us do the walk: “we’re in good shape, no problem. And if by 3pm we are not there yet we will just turn around”. So armed with slightly less than a litre of water each I began perhaps the most intense hike of my life. Which led me, 2 hours later, kneeling in the freezing cold black muck: alone,thirsty,tired and annoyed. I had separated from my boyfriend by accident as we clambered almost completely vertically up what looked like a massive boulder land-slide with tornado like winds pelting at us from all sides.We had gained 1000 meters by now and were at about 3500 meters above sea level, making breathing a bit more difficult.To get to this lake that was the goal of the hike we had only to traverse this high,alpine field. Except contrary to the pretty,sun-swept fields advertised in the brochure, the fields were one giant muck puddle and we were being bombarded with freezing cold pellets of water. I swear I have never been as unhappy in my life. 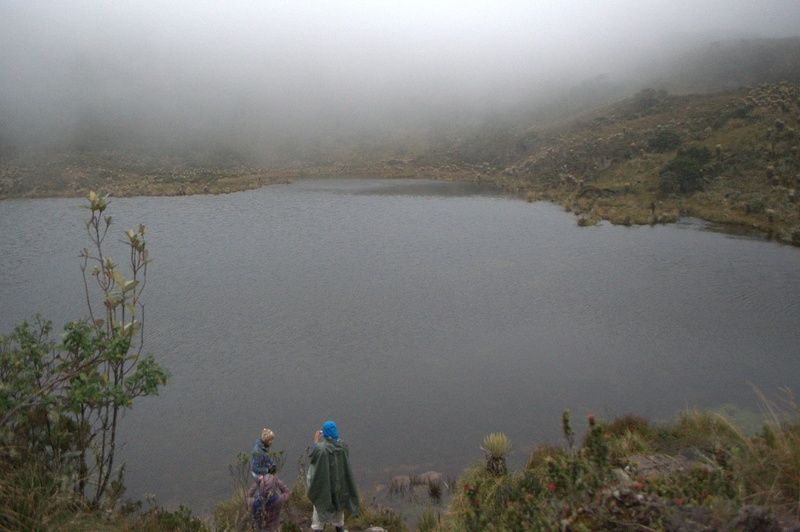 To make matters worse, when we finally reached the lake,30 minutes later it was shroud in fog, limiting our view to a tiny bit of murky water lapping at some bare, god-forsaken stones. 10 minutes later, after drinking a millilitre of water each and munching on a feijoa we continued the hike (at this point more like a race against time) back down to the rangers station and the bus. Absolutely amazing view once we finally got to the top. In a funny turn of events, 8 months later as I write this blog post I can’t help but remember that hike as one of the many highlights of my trip. The physical exertion, the fact that we actually accomplished that hike, the disbelief and awe on the local guides’ face that we met at the lake, and the look on the rangers face when we arrived back-quite literally bruised and bloody-but not only before it was dark, also in time to catch the final bus.